Currently used as a storage warehouse, 43 Brewery Road is a tired, 1950’s industrial building with little architectural presence. The intention is for the building to retain its use as a storage warehouse for the foreseeable future. The proposal is two-fold: to expand the storage capacity of the building, and to enhance and upgrade the existing facades. Currently, the most prominent façade looking onto Brewery Rd does not clearly indicate how the building functions. The building is split into two sections, with a stairwell dividing the facade and the main entrance situated to the far right. Our plan is to unify the building to ensure it reads as one entity, while clearly indicating the main entrance and visibly advertising to the outside world what the building’s function is. 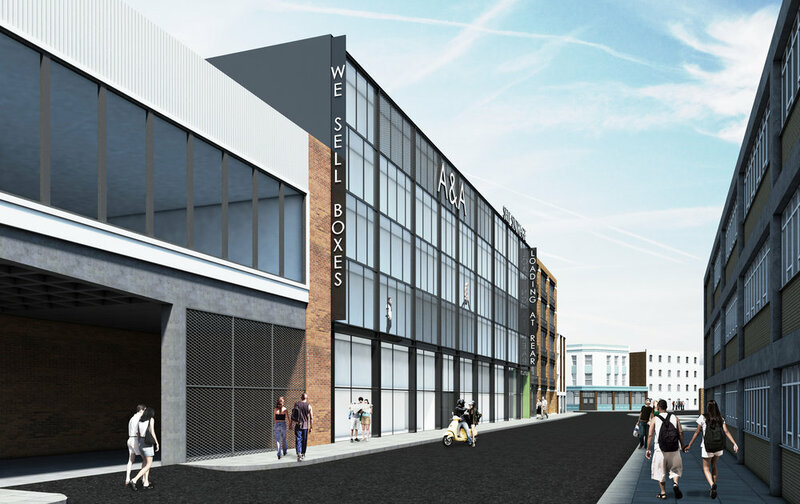 Since the site will enjoy a major refurbishment and a new lease of life, we want to ensure that the building demonstrates high-quality architectural design that describes the use of the building in a contemporary way.